For my second blog, I would like to talk about fat! Yes, FAT! Don’t let that word scare you. First of all, fat doesn’t make you fat. Contrary to popular belief, fat (the right kind, anyway) actually helps your body burn fat and can get you to your fitness goals faster. In the 80’s, the “low-fat” craze began and the high-carbohydrate diet took the diet world by storm. At the time, it seemed like cutting the fat was a good idea if you wanted to lose weight. But, we now know that the real science behind weight loss is burning more calories than you eat. It seems simple, right? When everybody was cutting fat out of their diet, they were eating more carbohydrates. This is really bad for blood sugar and causes spikes in insulin levels, which causes your body to store fat. Which brings me to the point of why you NEED fats in your diet. Fat slows down the absorption of carbohydrates into your bloodstream and it also keeps you fuller longer. If you don’t eat fat, your blood sugar will be spiraling up and down constantly and that is never good for weight loss or overall health. Now, not all fat is created equal. You never need to have trans fats in your diet. Trans fat is listed as hydrogenated oil and is found in processed foods like cookies, cakes, some peanut butter brands, and the list continues. Stay away from trans fat and foods containing them! You need to stick to saturated, monounsaturated and polyunsaturated fats. Saturated fats are from sources like eggs, organic meat, and butter. Saturated fat actually plays a key role in cardiovascular health and it helps your bones absorb calcium and coats your lungs so they can function properly. 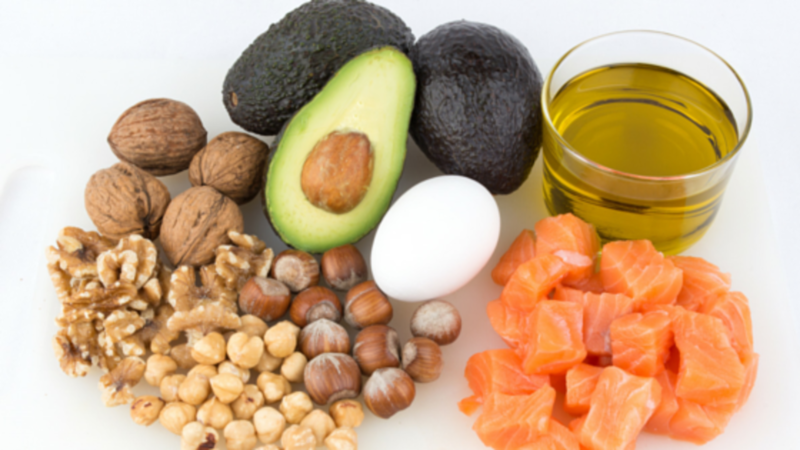 Polyunsaturated fats can be found in foods like olive oil, salmon, and some nuts and seeds. These fats can help lower your LDL (aka bad!) cholesterol levels. Polyunsaturated fats have omega-3 and omega-6 fatty acids which your body needs to function properly. You must get these fat sources from food because your body can’t make these essential fatty acids. Monounsaturated fats can be found in olive oil, avocados, and peanut oil, etc. These fats can decrease your risk of breast cancer, reduce belly fat, and protect you against heart disease. Who doesn’t want to be protected against those things?! Your brain is made up of approximately 60% fat! You need to eat fat to absorb fat-soluble vitamins like A, D, E, & K. Not consuming enough healthy fats can wreak havoc on your body and actually cause hormone imbalances and that is never good. So, there you have it! That is the skinny on FAT! Trust me, healthy fats don’t make you fat. Your body needs them to function. In moderation, just like everything else, of course. Hope you are all enjoying the workouts and eating healthy food to fuel your body!